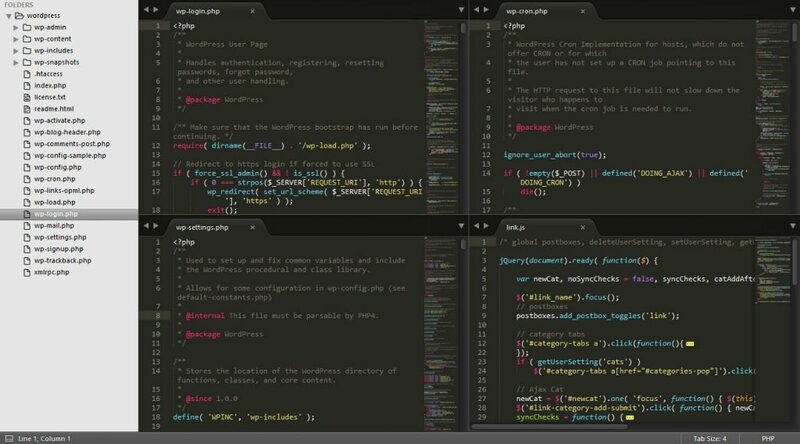 Code editors are the go-to tool for anyone looking to make more profound customizations in WordPress or dive deeper into web design and development. They can make the work much easier than standard text editors. The problem: There are loads of options, making it difficult to decide on the right tool. For that reason, we wanted to help you out by doing in-depth tests of some of the most popular code editors. A little while ago we started off with Atom. In this article we will continue with one of its competitors, the popular Sublime Text. If you want to know more about one of the most favorite code editors out there and what makes it stand out from the crowd, just keep on reading. Sublime can be downloaded from the official website. Version 3 is currently available in beta for both OS X, Windows and Ubuntu. There is also a portable version that can be easily run from a USB stick. You can download Sublime Text for free, however, officially it is not. After the evaluation period you are supposed to get a license for continued use. However, the download page itself states that there is no enforced time limit for evaluation which makes it appear more of a voluntary thing. If you do decide to get a license it will cost you $70. After picking your desired version, the download is done quickly. As already mentioned in the Atom review, Sublime is pretty small. The installation archive is a slim 8MB and after installation the program only amounts to 22MB and change. As you can see, there is no intro, help screen or any such thing. You just jump right into main editor screen. From here, you can add a project to Sublime by picking File > Open Folder. When you do, the folder structure appears on the left. Picking any file from there opens it on the right so you can start editing. Files and folders can also be saved together as projects to quickly open them up again later. So far so standard, now let’s look at some of Sublime’s standout features. Sublime has a lot of raving fans. The words “best code editor ever” are dropped regularly online. Let’s see why that is. 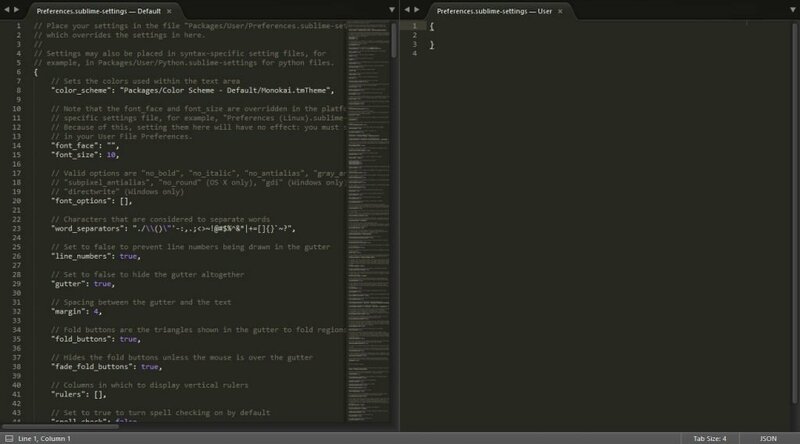 From the general design, Atom and Sublime Text are very similar. This is no surprise as many people think that Atom is actually based on Sublime. For that reason, it’s also no surprise that both come with code autocompletion and syntax highlight. Though in truth, probably no modern code editor worth its salt can do without. Sublime has native support for a few dozen programming languages and will color code elements appropriately (it even has several different color themes — more on that below). The code editor will even warn you of parsing errors in real time! In addition to that, Sublime comes with code autocompletion — including for user-created variables — and code folding. The latter makes large pieces of code more compact to view by hiding parts of it. While these are all pretty standard features, it’s still good to know that Sublime doesn’t skimp on the basics. Like Atom, Sublime Text can be fully customized via plugins. The quickly integrated Package Manager allows users to find, install, upgrade and remove plugins directly from inside the editor — usually with no restart required. Users can download packages from Github and BitBucket as well as PackageControl.io. The latter is Sublime’s own repository where the community behind the code editor publishes loads of plugins to enhance its capabilities. All in all, there are more than 3,800 packages available ordered by new, trending, recently updated, popular and other labels. With their help you can turn Sublime from a simple code editor into a full-fledged IDE and build exactly the type of development environment you need. For example, you can add the ability to sync files on a remote FTP server, preview code written in Markdown and advanced sidebar controls. Like the WordPress plugin directory, packages include extensive information on their functionality, installation and usage including screenshots. The only downside: That information is not available inside Sublime Text itself, only on the website. On the other hand, the installation via Package Control is insanely fast and you can control the settings for all packages under Preferences > Package Settings. Themes are also available as addon packages. That is in addition to the 22 pre-installed themes Sublime offers out of the box. Each of them enables users to change the color scheme of their code at the touch of a button. However, in contrast to Atom the rest of the UI stays as is. Something that quickly becomes apparent when using Sublime is how fast the program is. Built with C/C++ and Python, the code editor is very lightweight. In fact, when choosing it from the Windows start menu, it loads almost instantaneously. In contrast to that, Atom takes several seconds to appear on screen. This difference is also visible when handling large files. Sublime Text can do a lot more heavy lifting without running into problems. In my tests I had no problems at all and also couldn’t find any complaints about performance issues online. In fact, its stability is one of the most cited reasons people gave for preferring Sublime Text over other editors. Freezes and crashes seem to be few and far between. Another standout feature of Sublime is the powerful search functionality. Its regular search and replace function can look for regular expressions, make case sensitive searches or look for whole words. Plus, it lets you add search results to a buffer for later re-use. In addition to that, there is the Goto function. Upon choosing it, Sublime opens a search bar. When you start typing any file or directory name in your project or active folder, the editor will show fitting options lightning fast. The best part: when you move down the list, Sublime will automatically open a highlighted file in the background so you can see whether it’s the right one. When you have found it, a click or pressing enter will open the file in a new tab so you can start working on it right away. Finally, there’s the command palette. Everyone who is bad at remembering keyword shortcuts can open this collection of available commands, use fuzzy search to find what their are looking for and execute it without ever lifting their hands from the keyboard. Easy peasy. One of the most interesting features of Sublime editor is the ability to use several cursors at once. Effectively, this means that you can make the same edit in several places at the same time. For example, if you need to change the name of one variable across an entire file, you can select it once, have Sublime mark all other occurrences and then type in the new name for all of them at once. This is even more comfortable than using find and replace. The same feature can be used to reformat several lines of code at the same time. A useful example of this is creating an ordered or unordered list in HTML. Imagine writing <li> and </li> statements for all list items at once instead of copying and pasting them. Starting to see the benefit? Next up is the minimap. This is a small file overview in the upper right corner. It’s super useful to get an impression of how large your file is and also shows you current position while moving the scroll bar. You can even click right into the map to navigate to a certain place. It’s a little detail that really comes in handy especially for larger files. Finally, there is the ability to display text files in different ways. First, you can have several files ordered in tabs like in a browser window. That way, you may move and reorder them at will. Pretty standard, however, there is more. For example, you can display up to four files at once in form of a grid. In addition to that, Sublime also comes with other layout options like columns and rows as well as full-screen and distraction-free editing modes. WordPressers will feel right at home. Anything That Could Be Improved? Of course, Sublime has more features than the ones mentioned above. However, those are the ones that really stood out and make it an excellent code editor. Yet, there are also things that could be better, so let’s talk about that now. As good as Sublime is and as easy it is to get started, the editor is very much geared toward experienced users. That’s not bad in itself but sometimes can make it kind of intimidating for beginners. The place where this is most prevalent is the settings panel. When you open it, you access a text file that includes all the settings instead of a menu. Here, users can set different options to true or false and also override them in another file that is opened on the side. While everything is documented well, a UI solution would maybe have been the better option here. The same is true for package control, which is largely text based. In my personal opinion, Atom does a better job at this. However, I am also spoiled by WordPress’ way of handling plugin installation which is why I prefer Atom’s way of doing things. Since Sublime doesn’t have a large team behind it, development can be kind of slow. Bugfixes, new versions and advancements are less regular to arrive than with Atom. Case in point: the current version, Sublime Text 3, entered Beta status in the beginning of 2013. Now, at the end of 2016 it’s still not out of it. This also makes some people worried about the future of the editor. With only few developers, the project could die completely in case they are forced to abandon it. For that reason, there are some doubts about whether Sublime is future proof. Yet, so far there seems no need for that. Sublime is one of the most popular code editors out there and for good reason. The program is lightning fast, stable and mature. It also has loads of really useful features and many delightful details. In addition to that, with its modular approach and extendability, Sublime Text can be anything for anyone. The editor is suitable for developers of different skill levels and disciplines. While overall the user interface is similar to Atom, Sublime feels a lot more streamlined and it’s clear that the editor’s developers put a lot of work into it. It only feels like it could use a bit of the WordPress/Atom approach and maybe add a few more people to its team. That way, progress would be faster and Sublime could more solidify itself in the field of code editors. However, even so, for anyone who works with code for living it’s definitely worth the investment. Now over to you. If you work with Sublime, what is your best tip to get the most out of it? I started with Sublime some years ago, then I have used Atom, Visual Studio Code and Brackets. Very similar but Sublime is way faster and more stable than any others. Hey man, I’m all with you with Notepad++. Thanks for the input! Thanks for the comment, Eugene! Thanks for the review and insights on how to use the editor. I hope that you also review Notepad++. Thank you for the comment, David. I’d be happy to look further into Notepad++. It’s one of my favorite code editors. Cheers! Really useful package is PackageSync, which allows my Mac at home and my PC at work to always have the same packages installed. Hey Mark, thanks for the awesome tip! No way! Really? Thank you for this tip, Mark! We’ve just started using this wonderful piece of software. It truly lives up to it’s name. Sublime indeed. Happy it’s working out for you, Terence! Hey Noz, no promotion intended. 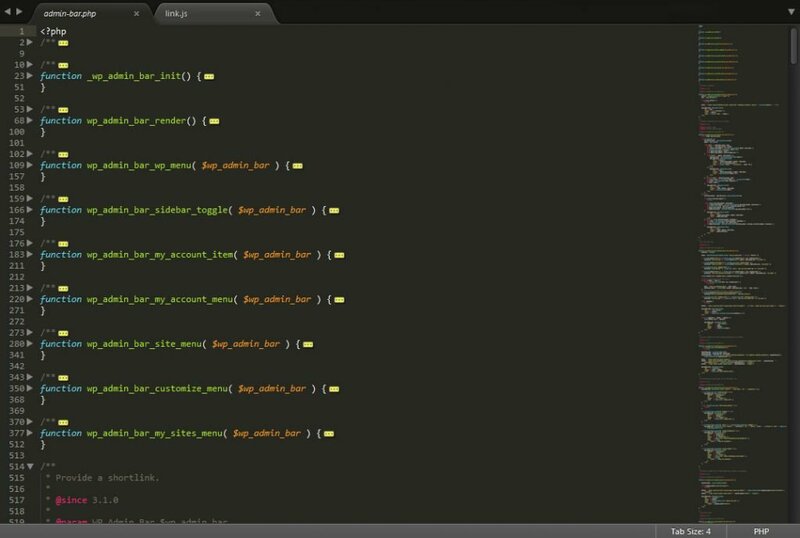 We are just looking into the code editors to give people ways to make their own decisions. Happy that Notepad++ is fulfilling all your needs. Cheers! No promoting really, but notepad++ is just for windows. So for mac users, Sublime is one of the best. Hey, thanks for the kudos! Happy to you liked it. Great to hear you have your tools of choice. Cheers! I used to use Sublime, but then I tried out Atom and have been in love ever since. Hey Malachi, I also really liked Atom. But Sublime has plenty of good stuff going for it as well. Thanks for the comment! Sublime with the right extensions is awesome on Mac. I really cant see myself ever using anything else. I use PHP Storm sometimes for debugging but Sublime is my Goto editor for pretty much anything. Hey Matthew, do you have any tips for extensions you would care to share with the rest of us? Thanks for the comment! Really wonderful and interesting and obviously useful post. Thanks a lot for sharing. I’m regular follower of this blog. Thank you again. Thank you for the nice comment! Please keep stopping by, we love having you around. Good review. What about Notepad++? Already have it in the back of my mind. Thanks for the comment! Project management and speed is what’s keeping me on sublime over Atom. I can leave a file open and unsaved and switch to another project and then switch back and pick up right where I left off. It’s just so much smoother in Sublime as compared to Atom where you have to remove a folder from a project to go to another. Thanks for your input Patrick! Those are important little details. Sublime 3 is a well thought-out app. It reminds me of Textadept built on top of Lua, except it’s built on Python, is more polished, but it’s commercial. However, for me NPP is still the #1 tool in my toolbox. It’s faster than Sublime, consumes less memory, is not any less capable in the things I do, plus it has superior ColdFusion support. Hey Tom, thanks a lot for the detailed feedback. I’m sure others will find it helpful. Sublime text is just the best to me.i have tried to switch to PHP webstorm , Atom and Visual Studio Code but always found myself returning back to sublime. It’s speed and stability is the reason why I have stuck to it. Very similar but Sublime is way faster and more stable than any others. Yeah, Sublime’s stability is really what keeps a lot of users around. Thanks for the comment! I’m on a PC and have worked with both Sublime and Brackets. I find myself gravitating more towards Brackets, but both are great tools. Hey Jules, thanks a lot for the comment! The Brackets review is coming soon. Oliver, happy to hear Sublime is working out for you and glad you liked the review!